Snow squalls brought the temperature down to a frigid 15.8 degrees Fahrenheit on the trawler January 20. The sea pitched in a rough chop. Cold Japanese fisherman plied the Pacific Ocean off the east coast of Japan with three klieg lights at 2:30 in the morning. They were the only vessel around. These weren’t just any waters the men fished in the freezing winds. The water was ‘hot’ with radiation. But the fish were plentiful and if they didn’t pass rad testing, they could be sold overseas. The vessel bobbed in the choppy waters several hundred yards away from the still stricken, still leaking, still out of control triple nuclear reactors in full meltdown at the Fukushima Dai-ichi nuclear power plant. Gone fishing in the hot zone. Exactly five years after the beginning of one of the two worst nuclear disasters in history, people are doing just that, eating fish from the seas off of Fukushima. If the catch is too radioactive under loose Japanese regulations, it’s sent to seafood consumers in the United States where the allowable radiation limits in fish are even more lax. Americans have been eating meltdowns-contaminated food for half a decade, as EnviroReporter.com’s Fukushima investigation shows. Radioactive cesium (caesium) is rising in fish caught off of British Columbia, the region (including Alaska and the Pacific Northwest) that supplies America’s ravenous seafood consumption. Two new studies detail the extent of the contamination in Japan, its cancerous impact upon the population and continued Pacific contamination. 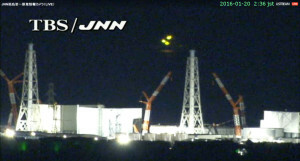 Government testing has shown sea creatures high in Fukushima radionuclides caught of West Coast of the U.S. and Canada. Yet judging from the robust U.S. consumption of crashing seafood stocks in the Pacific, which have repeatedly tested positive for Fukushima radionuclides, America has ‘gone fishing’ too in the gastronomical sense. Gone fishing. Most Americans would fit in this category when it comes to the Fukushima meltdowns and their effects. Meltdown fatigue, complicated science and an assortment of pro-nuclear naysayers comparing Fukushima’s radiation with eating bananas has understandably numbed great numbers of people to their peril. 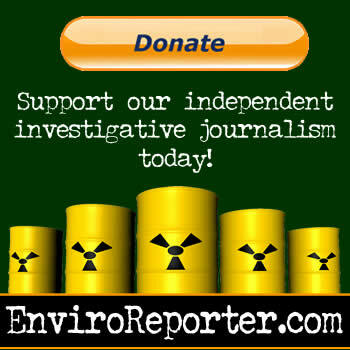 EnviroReporter.com’s 2014 anniversary piece Fukushima – The Perfect Crime? reported that 441 tons of highly radioactive water was sluicing into the Pacific from the stricken cores every day. 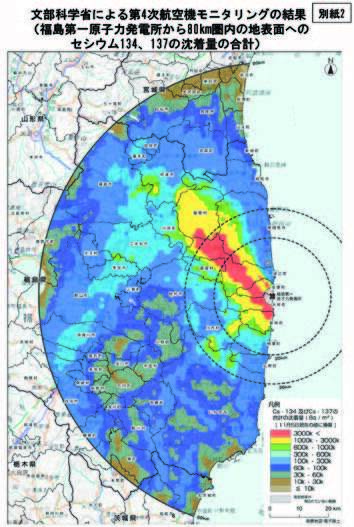 According to a new report by Physicians for Social Responsibility (PSR) and International Physicians for the Prevention of Nuclear War (IPPNW) called 5 Years Living With Fukushima, that number is now 300 tons per day. The reduction in toxic water released is the good news (even though more than 500,000 thousand tons of radioactive waste water has now gone into the Pacific since 2011). The bad news is up to 66,000 “excess cancers” will hit the Fukushima area because of the meltdowns, according to the report. Workers who fought to save the reactors and their comrades paid the highest price for their valor. Even five years out, no one is allowed to live within 12.5 miles of stricken reactors. The hardships experienced by the Japanese people who had to flee Fukushima is well documented in the new short film Five Years On – Voices of Fukushima. About 180,000 remain displaced. Coinciding with the PSR/IPPNW report launch March 9, Robert Alvarez, a senior scholar specializing in nuclear disarmament, environmental, and energy policies, Institute for Public Studies, and former senior policy advisor, US Department of Energy, issued a statement highlighting their tragedy. Five Years On – Voices of Fukushima from Peace Boat on Vimeo. Some cries for justice are finally being heard in Japan. Three top TEPCO executives including the chairman Tsunehisa Katsumata, 75, and two former executive vice presidents were indicted February 29 for professional negligence resulting in injury and death. It would seem unlikely that the judgement of these men will happen very quickly since it took five years to call them to task. Cleaning up the mess in Fukushima won’t happen very quickly either, says TEPCO. The company says it needs 50 years to contain and remediate the reactors with the missing, oozing corium. It claims to have completed 10 percent of that work. Greenpeace found that even if there is decontamination, it may subsequently be undone. “Mountain streams and rivers transport radioactive particulates and contaminated forest litter downstream, potentially contaminating areas that did not receive fallout, recontaminating ‘decontaminated’ areas, or discharging radioactivity to estuaries and marine ecosystems,” the report said. Radioactive fog, flowers and pollen? Yes, and hot honey too if the Fukushima sweet stuff soaks up the cesium like Croatian honey did from Chernobyl fallout adding fission to the flowers. It certainly has the potential to make even cherry tree festivals dangerous in the land of the rising radiation. Naturally, it’s the perfect place to have the 2020 summer Olympics, i.e. Tokyo’s Radiation Olympics. If the swimming events are staged in Fukushima’s rivers, caution would be well advised if Greenpeace’s report is accurate. That is a lot of goo. All of it is headed for the Pacific Ocean. What goes into the water in Fukushima eventually makes its way on the Kuroshio Current to North American shores. Many of the thousands of tests EnviroReporter.com has conducted and reported on since 2011 show Fukushima contamination in fish consumed in California and across America and Canada. Those tests keep coming in and include a variety of animals that have shown signs of Fukushima-related radionuclides in them. Cesium-134 is a Fukushima signature radioisotope because it’s half-life of 2.07 years precludes anything else from being the source like nuclear fallout from atmospheric testing decades ago. It usually is found in tandem with cesium-137 as it indeed was in the seal. Both of these isotopes of cesium are extremely dangerous with the shorter the half-life, the more intense a rate of ionization. That’s what makes cesium-134 such a perilous poison. NOAA also revealed that it tested water itself positive for cesium-134. Albacore tuna from the East Pacific Ocean, a foodie favorite, came in with 9.6 times higher in cesium-134 than the fur seal reading. The U.S. fish feast of 2014 weighed in at 4,743,025 tons. Over 72 percent of that haul came from the Pacific with most of that harvested off of Alaska. That’s where so many Fukushima-related isotopes have been measured in all manner of flora and fauna over the last five years. Foodies gone fishing from Fukushima who just have to have their seafood yet who care about radiation bioaccumulation can take heart. There are fresh water fish and seafood from the Atlantic Ocean. But eating anything out of the Pacific is lunched. The image of that trawler fishing in the freezing night in the fission-rich waters off of Fukushima Dai-chi is truly disturbing. On whose plates will that catch land? When it comes to Fukushima, and now five years of radioactive madness, most of America – and the world, seems to have simply gone fishing. That’s a plan? I like spicy tuna, but this is way too spicy. Let’s come up with a plan that doesn’t compromise the health of the planet. The first article that I’ve seen that the Japanese Government acknowledges the first [radiation] related death due to Fukushima’s nuclear meltdown. The first undeniable death, not the first one, I’m pretty sure. There will be more deaths, and the statistics will reveal many additional ones but not paired with a person’s name. It will simply be a surplus of deaths by various types of cancers. All very dry and academic reasoning which very poorly communicates the true scope of the tragedy. Lost lives, lost families, lost loved ones. Those will never be adequately compensated, only grieved and suffered by the friends and families of the victims. Kathy, you will find a couple studies at “Fatalities And Injuries Resulting From The Fukushima Nuclear Catastrophe”, under the USA heading. Is there any data on births and childhood cancer on the Pacific coast? Regardless of whether you believe this information or not, can we all agree that nuclear power is the FURTHEST thing from clean power?!? There is 0% health risk from solar or wind energy, which are endless, plentiful and abundant, AND entail no radioactive poisons that require storage for ETERNITY. I just don’t understand how people can be so stupid to think that nuclear power is clean. Yes, fossil fuels are destroying the planet, so let’s be smart, and pick an alternative that won’t destroy lives and ecosystems! AHH! Re TomanTrav: This troll is less believable than Donald Trump and that’s an accomplishment. We published this tripe because it is inadvertently amusing. TT here didn’t live in Fukushima and didn’t meet anybody “doing it all by themselves” with no government help there. This phony is simply tripping the light fuktastic. Meh, HYPE – I LIVED in Fukushima for 3 months, measuring radiation with a GeigerCounter every day, taking photos, measuring bath water radiation, food, and it was all lower than 1mSv… When I went to SanDiego, the hostel I booked had 12 mSv or radiation walking down the hallway and in the rooms. Some older LCD TV’s give off 15mSv of radiation, and flying to and from Japan to US, Canada, etc you get zapped with 20mSv for about 5-10 hours, and I am not dead and have no cancer (got scanned by a clinic that specializes in Radiation reading out of propaganda infused paranoia like this site is spreading)… so go Out and buy a GeigerCounter, measure everything and everywhere you go, and find out for yourself. Don’t just take the hype as gospel. Be a THINKING HUMAN BEING. And Don’t Donate to Charities that claim to be helping these people, bc no-one I met in Fukushima towns got ANY money or help to rebuild. They are doing it all by themselves. We are imploding! STOP THE INSANITY!!! Today is the day when Woods Hole Oceanographic found Fukushima radiation on the West Coast? I don’t like the metaphor used to liken swimming in the ocean to a dental X-ray. This probably assumes you don’t drink any of it or eat the contaminated fish… And no one ever says how many extra cancers there are due to dental X-rays. It’s like the other metaphors that speak of the radiation acquired by eating a banana or sticking your elbow out of car’s window into the sun. One doesn’t eat or drink a dental X-ray. Does it bio-accumulate in your body tissues? If a million people swam in that ocean or ate the contaminated fish frequently, how many of them would die early of cancer? The answers to these questions are probably not knowable. And, any individual case can be denied as not being caused by excess Fukushima radiation. That person is simply designated an unlucky one in this game of radioactive roulette. I’m not sure what the threshold is for any extra radiation. The body can heal some damage, and that probably masks some low level radiation exposure. But exactly where the damage occurs, how long it occurs, and how healthy the individual is, probably interacts heavily to determine when a cancer is going to strike. I’m not saying we should avoid all nuclear power, let’s just be very careful about how we build them, where they are placed, and retire them when they are past their useful lives and safety margins. To do so correctly (i.e. Conservatively), would significantly alter the economic value of nuclear power. It would likely negatively affect corporate profits in the nuclear industry. One day, other power sources will replace fission nuclear plants, and we will all be safer. I can’t wait for that day to come. The understandable anger at TEPCO and the Japanese government for the handling of the ongoing triple meltdowns at Fukushima sometimes overwhelms the sympathy so many feel for the Japanese people who are bearing the worst of it (with the Pacific Ocean’s flora and fauna a very very close second). The government’s NHK mouthpiece, which does have an excellent news service and documentary outfit, has put together this remarkably moving documentary (unseen by us in full yet) called The Phone of the Wind: Whispers to Lost Families which airs tonight on Channel 28.4 in Los Angeles. The program is described as such: On a hill near the ocean is a telephone booth known as the “Telephone of the Wind”. It is connected to nowhere, but people come to whisper messages to family members lost in the 2011 tsunami. Denise Anne and I look forward to this piece as we are very close to the Japanese people on both sides of the stricken Pacific. We hope you find it moving as well. This man-made disaster is but another blunder by the self righteous we mere lilliputians are forced to live side by side with. The new generation of American apathetic ignoramuses simply think we can coexist just fine with the goo. So, as long as we don’t over think or even think about the situation, we’ll all be fine. I hope the real estate market along the California Coast crashes and we can at least be left at peace from the arrogant Wall Street sh*t heads that are the back bones of America’s problems. I hope they go somewhere else to raise their brats, fly their helicopters and drive their fancy cars. Of course, these tycoons did not have everything invested in the fish markets so sadly, they will stay and we will have to continue to put up with their holier than thou smugness. I wish the general public would wake up…..but they won’t. @ Michael, here is another recent report posted into EnviroReporter’s “Radiation Food Lab”, that directly relates to what you report there. Inspectors picked up samples from the boxes packed with seafood that the middlemen had brought. They then put the samples into buckets so they could be checked for radioactive contamination. While they minced the meat, the inspectors examined the samples with a radiation detector. The monitor displayed a circle, indicating radioactive concentration levels were within the criteria. Having passed the test, a certification label was immediately put on each box and the fishery products were taken away by trucks for delivery. The radiation testing techniques described in this article, to test for radioactive contamination in the freshly caught fish, raises questions about how serious the Japanese are about keeping contaminated Japanese fish off the market! Waving a radiation detector briefly over some fish is not a proper test. Testing this way would not detect the small levels of contamination that can affect human health. The researchers found up to 54,500 becquerels per kg of radioactive substances in the Maeda river in Futaba town, where the plant is situated, and 39,600 becquerels in the Hiru river in Fukushima city. They also detected more than 10,000 becquerels at five other locations in four municipalities. The prefectural government plans to study restricting access to rivers with high concentrations of radioactive materials. National Public Radio in America had a story this morning that applies to our well-heeled sushi lovers in the Bay Area, all of whom believe (if they think about it at all) that they are immune to Fukushima meltdowns radiation in their expensive chunks of exquisite (when alive) species of usually over-fished critters. It has been our experience in EnviroReporter.com‘s reporting on Fukushima for the last five years that the higher the income bracket, the higher the denial about radiation-tainted sushi glowing with cesium-134 and cesium-137 which cause virulent blood and bone cancers. There are dozens of San Francisco sushi bars. The “high-end” sushi joints have Japanese fish on offer for a pretty penny, fish like the ones being caught in the screen-capture that leads this story. I believe that we humans are meant to learn by example. The radioactive contamination of fish in the Pacific is a new event we as a species have not had to deal with before now. Our only prior collective experience was fish in the area around Hiroshima and Nagasaki whose radioactivity was largely unreported, and fish in the waters of the Pripyat River in Ukraine and Belrus. However, we are now 30 years past the 1986 nuclear accident at Chernobyl, and there are many lessons to be learned from the land based radioactive contamination which persists in Ukraine, Belarus and Southwest Russia. At the time of the Fukushima disaster, coincidentally the New York Academy of Science had just published an English translation of a book written and edited in Russian by 2 Belarussian and 1 Russian physicians collecting medical journal articles in their language describing, in practical terms, the effects of radiation exposure on the people who live(d) around Chernobyl. The book’s 2010 English translation was called “Chernobyl: Consequences of the Catastrophe for People and the Environment, Volume 1181 (Annals of the New York Academy of Sciences) 1st Edition” by Alexey V. Yablokov (Editor), Vassily B. Nesterenko (Editor), Alexey V. Nesterenko (Editor), Janette D. Sherman-Nevinger (Consultant Editor). There was vehement resistance from the Western-medical-military-industrial-complex to giving the book any credence at all, but upon talking to Ukrainians who lived within range of the radioactive exposure, and in reading interviews of Ukrainians who worked on trying to contain the mess at the plant, (people called “liquidators” in Ukrainian,) every word in Yablokov/Nesterenko’s book rang true. It still rings true now in terms of what physicians and civilians are seeing in Japan and in the natural land based environment around Fukushima. I think of my children and grandchildren, and want to protect them by knowing, and having them know, “what to do” with about practical consequences of nuclear accidents and nuclear industry sloppiness at Indian Point, Fukushima, Chernobyl, Hanford, Area IV and other sites where accidents or gross negligence has not yet occurred. That goal on my part, and on the part of other concerned people like me, is constantly frustrated government, industry and the scientific/medical community’s insistence on secrecy, materially misleading statements and outright lies. There is no point in their maneuvering. Governments are not going to be overthrown because of nuclear accidents. Lawsuits over radioactive contamination tend to spectacularly fail. What is the harm of people knowing and protecting themselves? I wish these lovers of secrecy about nuclear contamination would think of disclosure of the truth about nuclear contamination in the same vein as the concept of kashrut or kosher as it relates to food, food preparation and house-keeping, which are said to be divinely inspired. Most of the basic laws of kashrut are derived from the Torah’s Books of Leviticus and Deuteronomy. Their details and practical application, are set down in the oral law (eventually codified in the Mishnah and Talmud) and elaborated on in the later rabbinical literature. While the Torah does not state the rationale for most kashrut laws, the reasons are obvious, the practical and hygienic, inspired by people’s experiences. What 20th and 21st Century people learn about food and water safety, and living safely, as related to nuclear contamination are a logical extension of kashrut, which should not be kept a secret but be studied, talked about and followed as part of common sense food safety with thanks to the Almighty for allowing people to have the intelligence to look at facts and consequences and live their lives accordingly. nutrition. The Japanese Secrets Act of 2013 won’t stop the truth! Oh stock, we despair. Why didn’t we think of that? We couldn’t see the forest for the curies. THANK YOU!! THANK YOU SO MUCH FOR REPORTING ON THIS!!! The World at large MUST face the REALITY & magnitude of this horrible situation…THEN THEY MUST TAKE ACTION!!! Coincidence? Coincidence Nancy Reagen was buried in Simi Valley where they had that terrible meltdown in 1959? All on the same day as meltdowns in Japan! I think not. Thank you for all you do! It is greatly appreciated. I am glad I stopped eating all seafood right after that happened. Thank you, Michael, for this informative update to the Fukushima nuclear meltdown story. Invisible danger may be hidden, but it is still very much a concern that should be taken seriously. Future generations will be affected and the public needs to know that ignoring the risks does not make them go away. It’s the nature of nuclear contamination that it is not apparent to the 5 senses. Externally, and particularly in low doses, it is not especially harmful. But, close prolonged contact can bring health consequences. And, internal contact brings even greater risks. Once incorporated into our bodies, it can bring a lifetime of elevated risk. Those with the longest lifetime remaining, and those rapidly incorporating certain radioactive isotopes within their soft tissues and bones are at greatest risk of encountering life shortening health consequences. Personally, I still enjoy and consume seafood, but I do so mindful of the risks. Even if one selects carefully, one must trust the labeling to determine the origin and species of seafood. Reducing certain kinds of seafood consumption, and consuming it later in your lifespan, as I do, may be the best one can do in an uncertain world. Thank you again, Michael, for reminding us that the natural world is one that cannot be considered completely safe. Prudence and moderation, within this context, gives us the best chance to enjoy the fruits of this world, without exposing ourselves to unnecessary health risks.